Swedish packaging firm ​​​Tetra Pak is using Microsoft HoloLens mixed reality technology to speed-up issue resolution for food manufacturers. The move will reduce machine downtime and productivity loss for the customer, and protect them against risks to food safety and quality.??? 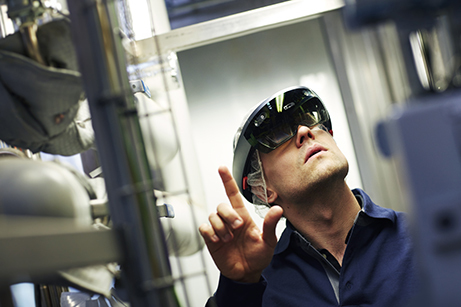 In case of repairs, Tetra Pak service engineers use HoloLens headsets to rapidly diagnose and fix machine issues, even in the most remote locations. The headsets allow service engineers to make a Skype call to a Tetra Pak service center and communicate with an expert who has better knowledge of a particular machine. The engineer will be guided through a repair, reducing the time required to fix the problem. The new, digital tools allow Tetra Pak’s cloud-connected machines to predict exactly when equipment requires maintenance, preventing several breakdowns. Tetra Pak Services vice president Johan Nilsson said the company’s customers operate in a complex landscape where quality is essential and production lines are sophisticated. Tetra Pak is piloting the service with 50 HoloLens devices, in the Greater Middle East, Europe, and the Americas. The company aims to roll-out the service to other markets in next year. The HoloLens application is being exhibited by Tetra Pak and Microsoft at the 2017 Hannover Messe event.?? Image: A service engineer using HoloLens. Photo: courtesy of Tetra Pak.